Man can lives without food for over 30 days, however water we need on a daily basis. As a basic preparedness and generally extraordinarily handy item, everyone needs a canteen and cup kit. 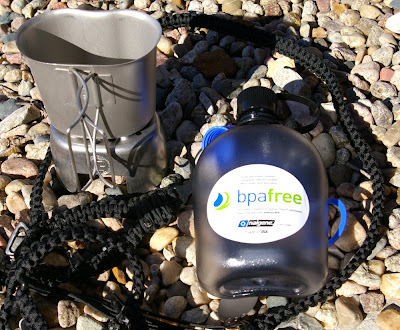 These two simple items provide you with the ability to carry and boil water which are two elements essential to survival. There are sadly a ton of cheap canteen kits on the market; most featuring Chinese BPE laden plastic bottles and reactive aluminum cups which taint flavor. On my quest for the best 100% US made canteen kit available, I ended up on CanteenShop.com more than once and decided they were about the only supplier offering a quality all American Made canteen set. After digging further I found they offered the ultimate canteen kit available, the Para-Cover Deluxe Canteen Kit which puts a unique updated modern twist on a classic canteen kit design which includes a canteen, stove, cup, spork, and paracord sling in one nice neat little package. Canteen - The canteen is often focused on most and Canteen Shop went right for the best with a new Nalgene BPA Free Oasis Canteen with Black Cap. The Nalgene bottles normally comes with blue caps (symbolizing potable water), however most people want a more tactical black cap for their canteen so Canteen Shop includes the upgrade. Depending on the kit color you select the Nalgene bottle will come in the corrisponding Coyote, OD green or Grey colors. Nalgene bottles are made from BPA Free impact resistant light weight material that does not retain taste, odors, or stains, are dishwasher safe, and able to withstand temperatures from -211 to 275 degrees F. The design fits a standard GI Canteen Cup and include a leak proof screw on cap. The Nalgene bottle is the best canteen made all for around $11 vs the typical $5 for a quality US made standard GI canteen. It is a smart upgrade. Stainless Cup - Although the canteen gets all the attention, the cup is actually the most important part of the kit because it has multiple purposes beyond just holding water. Again Canteen Shop has gone to great lengths to assure the cup they include in the kit is the best and feature the official military USGI Heavy Gauge Stainless Steel Butterfly Handled Cup. The heavy gauge stainless construction will easily handle direct fire heat. It is literally indestructible heirloom quality that will be around for centuries all without adding any extra flavor to your water or cooked foods. 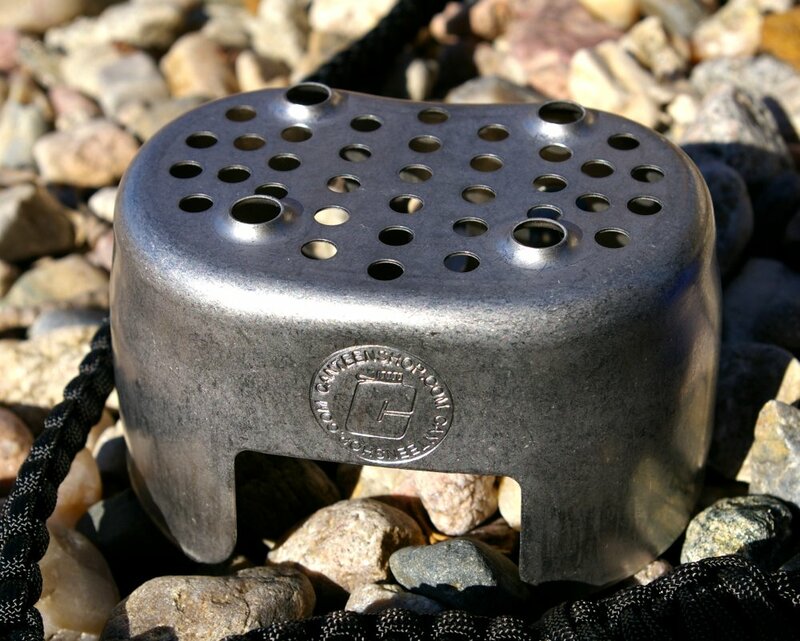 CanteenShop GrillTop Stove Stand - The CanteenShop Stove Stand was designed by the owner out of necessity. The original Military issue stoves are very difficult to find and had room for improvement so the owner of CanteenShop decided he would design and manufacturer a GI compatible update. 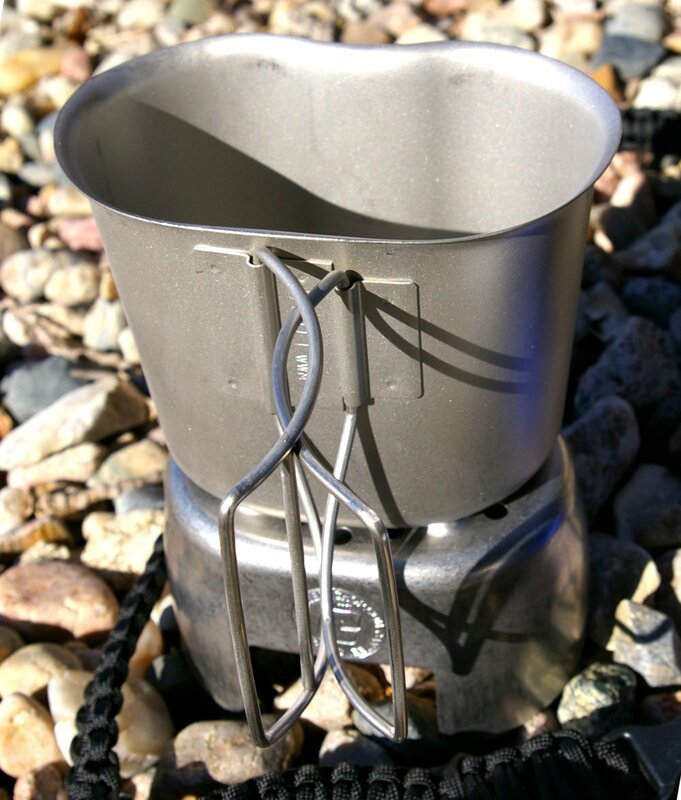 The CanteenShop GrilTop Stove stand is made of Heavy Gauge Stainless Steel in Ohio with a GrillTop design, that keeps your cup above the flames to maximize heat. The is a multi-purpose design that can be used as a stove, grill, berry picker, strainer, small Shovel, fire starting implement, lantern (with the new SS HC Lid coming out), and what ever else you can think of and can be used with any fuel source that will fit under the Stove Stand such as alcohol stoves, Trangia stoves, fuel tabs, or wood fuel. 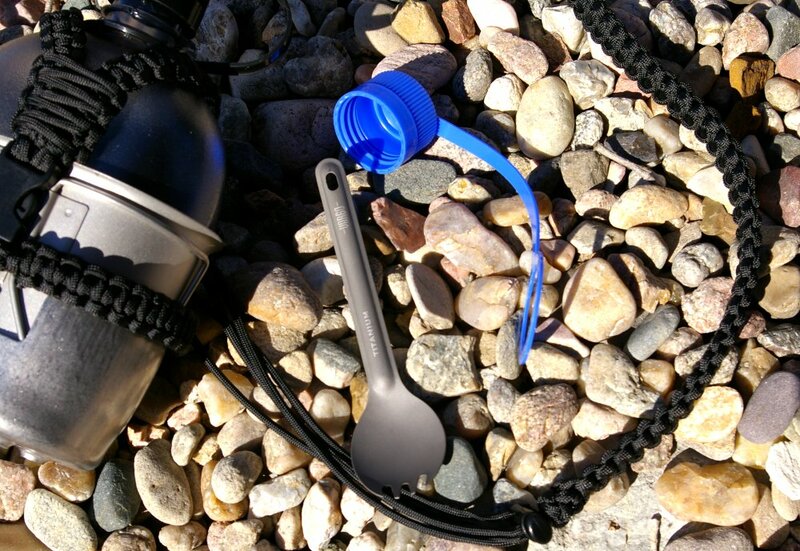 Vargo Titanium Sport - Just because you are traveling light does not not mean you need to feed like a cannibal, so they have included a Vargo Titanium Spork which slips securely in between the canteen and cup. Para-Cover and Para-Cord Chest Strap - Let’s face it, most of use are not going to be sporting a GI belt or pack just to carry a canteen and the innovative design by the CanteenShop owner delivers a simple and efficient solution. The Para-Cover was an idea the owner had and approached The Para-Cord Guy to bring the idea to life in a hand made product. 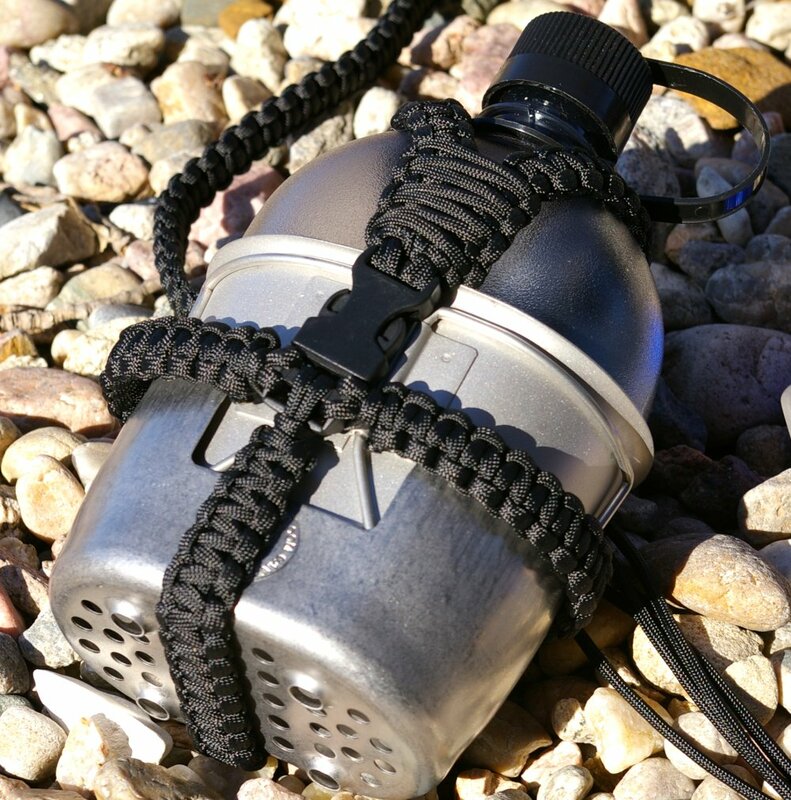 The Para-Cover is made from Mil-Spec 550 Para-cord and provides a good looking and functional bare bones light weight, and super strong cover. More importantly, it provides easy access to the cup and stove unlike every other canteen cover out there which requires 5 minutes of wiggling the cup out. The paracord cover allows the storage of the Stove Stand, Canteen Cup, Canteen, and Spork easily and provides two triangle connection points for Strap attachment. The rear strap can be used as a belt pass-through. These are hand made by The Para-Cord Guy and we are receiving them in limited quantities. OD Green, Coyote Brown and Black are available now. The Paracord Cover also includes an adjustable chest strap which I found a comfortable option for long hikes. Although custom colors are available on a special order basis, I stuck with the black version which looks stylish enough that it looks at home in even urban settings and walks around the neighborhood without screaming “I am that guy”. A general rule is that for every inch of paracord cobra stitch, like that used to create the Para-Cover, you actually carry one foot of paracord. Should an emergency arise, the shoulder strap alone should deliver around 50 ft of paracord which could prove mighty handy. The fit and workmanshipof of the cup, stove and para-cord cover are all very good and of course the Vargo Spork and Nalgene bottle are both top quality. Functionally the entire setup works perfectly as advertised, but it is the stove, Para-Cord Cover and Strape, and Vargo titanium spork that transform this kit from just a canteen and cup to a multi-fuel mini-camp stove kit. With this kit you have everything you need to prepare food, eat, and boil water all in a very light weight and durable package. The only thing I added was a small Scotch Brite pad packed in the bottom of the stove to for general cleaning and removal of any soot before it is stored and carried. This kit offers so much more utility and versatility than a standard cup and canteen kit so you cannot just look at the total price, you have to look at this as a complete stove and cooking set and the quality of the components to see the total value. The Canteen Shop Deluxe Kit is the king of the canteen kits with the best of each component and delivers a complete cooking and stove kit with about the same weight as a standard canteen and cup kit. 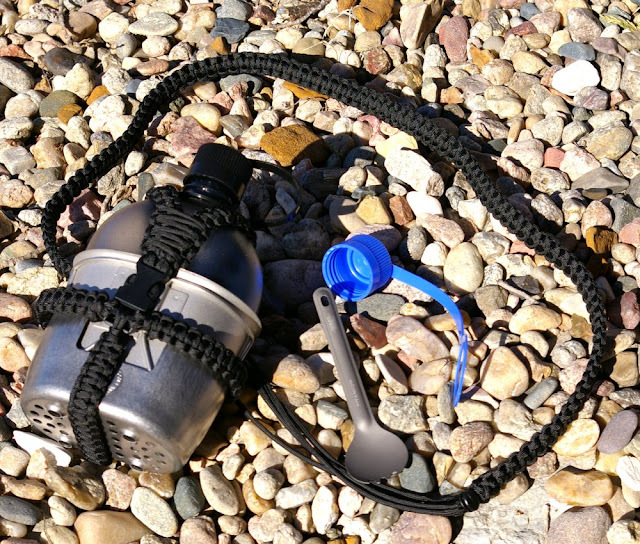 The para-cord strip and cover transforms the Canteen Shop Deluxe kit into something useful every day versus a specialty product just for camping. On a long day hike? Slip on this kit and you can stop and make a hot cup of coffee or tea and prepare a hot lunch instead of just having water and granola bars. If your travels take you further, the weight of this kit will not bog you down. Its lightweight, compact, and durable. Great for minimalists. This is an outstanding investment for elegantly simple kit for anyone including preppers and common sense preparedness folks.